We had a private room and had only booked one night, but we really liked the vibe in this hostel and wanted to stay longer. The staff spoke english and were super helpful, especially with securing transporting and giving ideas of what to see around the town. Everything here was amazing! Breakfast is the best I’ve had in a hostel, staff is very helpful, it’s very clean, and security couldn’t be better. Only complaint that I have is when at 6:11 am I went in the kitchen to microwave hot water, I was told by a staff member, “kitchen doesn’t open until 7, bro.” It didn’t sound professional, at all, and where in the hell else am I supposed to get drinkable water at that hour? If it’s closed, he shouldn’t be doing his homework on a food counter. This was a great hostel to stay in. I stayed here for Día de los Muertos, and it had a great social atmosphere. The staff was incredibly helpful and was very quick to fix any problems that would arise. They also knew all the great spots to eat and could really show you what Oaxaca has to offer outside of dwelling in the city. Great vibes and great staff. Oh yeah, they also make you breakfast every morning. A truly wonderful experience. I hope to return someday soon. 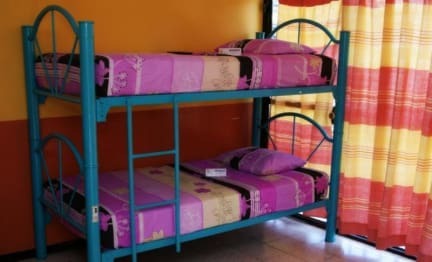 Hotel Pochon is a great hostel to stay in for your Oaxaca experience. The staff are legendary for their friendliness and their knowledge of the area. The breakfast is great, simple but for the price it is very generous. I was also impressed by how accommodating the hostel was for your needs: storing gear til you returned, advising you where to go, etc. Showers are often cold. Be warned. Really had a nice stay here. I like how there is a communal space where everyone can interact and eat together. Also, love the movie nights. Extra points for the friendliest and most helpful staff. Good value and has a working computer which is handy for planning. The breakfast is yummy. Downsides are rubbish showers - basically a trickle that takes over 5 minutes to warm up if you are first in, and gritty bathrooms. We stayed 4 nights and I don't think they were cleaned once while we were there. Also extremely noisy glass doors meant loud bangs at all times, which also means no one feels the need to keep their voices down in the middle of the night, and the light streams through too. There were a few extremely helpful and really lovely locals / Mexican folks working at the hostel, who made our stay worthwhile. However, the bathrooms were quite dirty, the showers didn't work well, and there were quite a few foreign staff who didn't speak much or any Spanish and seemed very confused the entire time. Also, it was extremely loud during the night from road from cars passing by and the hostel was quite a bit further from the main drags on quiet roads than we had expected.